Home » Articles » Local » Winter Beerfest is Officially Here! Winter Beerfest is Officially Here! 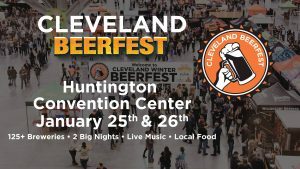 The Cleveland Winter Beerfest is back! Head to the Huntington Convention Center (300 Lakeside Ave E Cleveland) this Friday Jan 25 and Saturday Jan 26 from 8 – 11 p.m., for the ultimate experience! Partake in hundreds of Craft Beers with thousands of Craft Beer Fans! Grab a bite to eat at local food trucks and restaurants! Enjoy nightly connoisseur receptions in the Ballroom! Regular Admission tickets are $50 in advance and $55 on the day of the event. Early Admission tickets (doors open at 7 p.m. instead of 8 p.m.) are $60 in advance and $65 on the day of the event. Connoisseurs Reception tickets must be purchased in advance ($90). Purchase tickets today at http://www.clevelandbeerfest.com/winter/buy-tickets/. Proceeds benefit the Music Education Society and their mission to support music programs in underfunded schools. For more information, visit http://www.clevelandbeerfest.com/winter/.